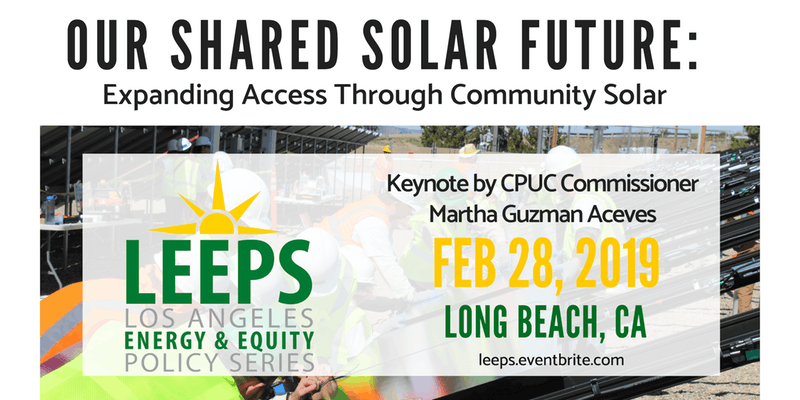 The Center for Sustainable Energy is proud to be sponsoring an upcoming event focused on the potential of community solar to expand solar access to the households who face the greatest adoption barriers. In "Our Shared Solar Future: Expanding Access through Community Solar", GRID Alternatives Greater Los Angeles' fourth event in its Los Angeles Energy and Equity Policy Series, advocates and experts from the climate justice and clean energy spaces will convene to discuss the growing impact of community solar from around the country, and explore which policy developments need to take place in California to ensure expanded solar access to its most vulnerable residents. Visit the registration page for a full list of panelists, additional event details and to register for this event. Be sure to use the promotional code "CSE" to save $15 on your ticket.